The amazing leaf Aloe Vera needs no introduction. Aloe vera benefits for skin are well-known to almost everyone in the world, that’s why this earned a huge and permanent place in our house as well as in most of the DIYs. This plant is in use from ancient times because of its healing properties. 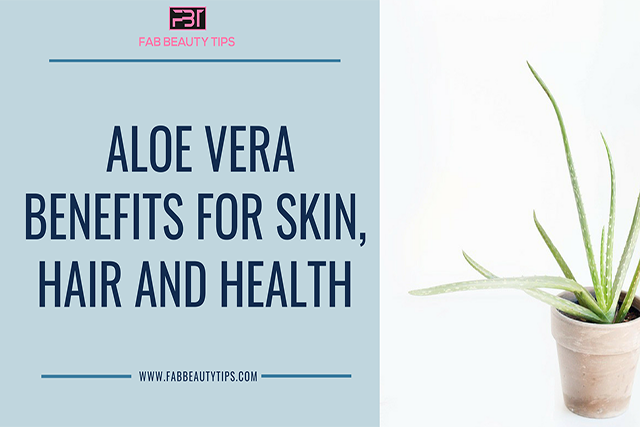 Here we are sharing some amazing Aloe vera benefits for skin, hair, and health which have to be known by everyone if they don’t know till now and the reason why this is a must-have plant in everybody’s house. Down below I mentioned 20 benefits of Aloe vera which everyone should know. As you get aged you will see the wrinkles and fine lines. These called signs of aging. To prevent these from appearing early use aloe vera on the face directly or by mixing it in honey. Your skin loses it’s elasticity and aloe vera help you to make the balance. Aloe vera is always used in so many creams and lotions for moisture. Aloe Vera increases the water content in the skin and makes it hydrates all the time, which result in healthy skin. If you have dry skin then search for the products which have aloe vera extract in them. If you are a person who has lots of acne and pimple issues on your face or body, and couldn’t find any moisturizer for you, then aloe vera is a must for you. It just not only moisturize your skin but also reduce acne and pimple while soothing them. It’s antibacterial and anti-inflammatory properties makes it a wonderful product. Aloe vera is worldwide popular for its soothing properties, which make it a magic potion for the sunburns. It soothes the burn, reduces the inflammation and also cures the redness. Whenever you come home just wash your face and apply aloe vera and just relax. With the passing age, our skin loses its elasticity, which means there could be a presence of stretch marks. Or by any means you get the stretch marks, aloe vera will become your best friend in that case. Apply some fresh aloe vera gel on marks and leave it for some good time. Do this regularly to see the results. Aloe vera has anti-inflammatory properties, which makes it effective for the wounds and insect bites. You can use it as a lotion or directly as a gel. It will soothe the wounds and reduce the irritation caused by the insect bite or because of any cut. Many people don’t know that aloe vera is a magic for the people who are suffering from the problem of psoriasis. It moisturizes and hydrates the skin area of psoriasis and condition the area deeply. It helps in removing the scars too. Aloe vera not just only good for skin, it has a number of benefits for the hair too. The first benefits of aloe vera for hair is it promotes the hair growth. If you are facing very slow growth and want long hair in less time then do apply aloe vera. It removes dead skin cells from your scalp, which allows your hair to grow. Aloe vera is best for the scalp which has too much dandruff and itchiness also. Most common shampoos which are meant for dandruff has aloe vera extract in them. It nourishes the scalp and makes it dandruff free. It also fights against any infection in the scalp. Aloe vera maintains the ph level of the scalp. If the ph level is unbalanced then it may cause you so many hair problems, like hair fall, dandruff, itchiness, oily scalp and much more. Aloe vera helps you to restore the lost ph level of the scalp and balanced it. Aloe vera is proven to be the best conditioner in the world when it comes to the conditioning. It contains proteolytic enzymes that remove dead cells. It helps in cells regeneration which helps in repairing the hair and the water content make it shiny and soft. Aloe vera apart from moisturizing and conditioning the hair, adds shine to them. There are some shining sprays which are natural have aloe vera in them. If you too want shiny hair then take the aloe leaf and scoop out the gel. Keep it in the refrigerator for some time and apply it on the hair and scalp. You can also apply this in any hair pack. Aloe vera is the best and cheap remedy to control your frizz without any heat and expensive treatments. Use aloe vera gel on any homemade hair pack or apply directly on hair. In frizzy hairs, moisture content is very low, for which aloe vera is just perfect. Aloe vera juice is helpful in so many diseases and is beneficial for heartburn, chest pain and trouble with swallowing. Aloe juice is an effective cure for all these. It has anti-inflammatory properties which soothe the stomach and control any type of heart disease. It is true that aloe vera helps in controlling the problem of cholesterol. Clinical trials have shown that aloe vera can reduce the cholesterol present in your vital organs. So include aloe vera juice in your diet and daily routine. It also was proven in the science labs that aloe vera regulates the blood sugar well. It has antioxidants and minerals which helps a person to control and to regulate their blood sugar and save them from any further health damage. The juice has laxative properties that can aid in digestion. It encourages the good bacteria and regulates the bowel movements. It cleanses the digestive tract. The aloe juice is easily digested by the stomach and healthy for the whole body. Is aloe vera good for everyone? Ans: Yes! The aloe plant is very healthy and effective for everyone. How many times one should apply this on hair? Ans: It would be advised to use it once a week or once a 15 days as per your need. How long one can store the fresh aloe vera gel? Ans: You can store it for 1 week in the refrigerator. A very helpful article. Many of these are new to me.. Thanks for sharing. Aloe Vera is a magical plant, it has numerous benefits on skin and health. Thanks for sharing many uses of this plant with us. I has been 4 days since I started taking aloe vera Juice in the morning! It is really helping! Loved your detailed list of benefits! Aloe vera is a magic herb. It is effective in almost all types of skin or hair issues. Very nicely compiled. Aloe Vera is a magic plant and I can use it like for any health or beauty concern. You have explained the use of aloe vera beautifully. I love aloevera and aloevera products. Great to know so many benefits of aloevera. Although I am unable to take it orally. Aloe vera gel has worked like magic for my skin when it was breaking out like crazy. Looks like it can help my dandruff too which I tend to get in the monsoons. Aloe gel is such a must have for everyone ! !